Messaging to “live your dreams” and “follow your passions” are ubiquitous in today’s culture. From TV ads to Instagram posts, these pushes to live a full life feel so prevalent that it’s easy to feel jaded or wonder if those memos are reserved for a privileged few. But when those sentiments are being shared from someone who actually made their dream a reality, and who’s living out their purpose daily, maybe that’s someone worth listening to. That someone in this story is Erik Gordon, a passionate outdoorsman and the owner and operator of Carabiner Coffee. Photo courtesy of Carabiner Coffee. 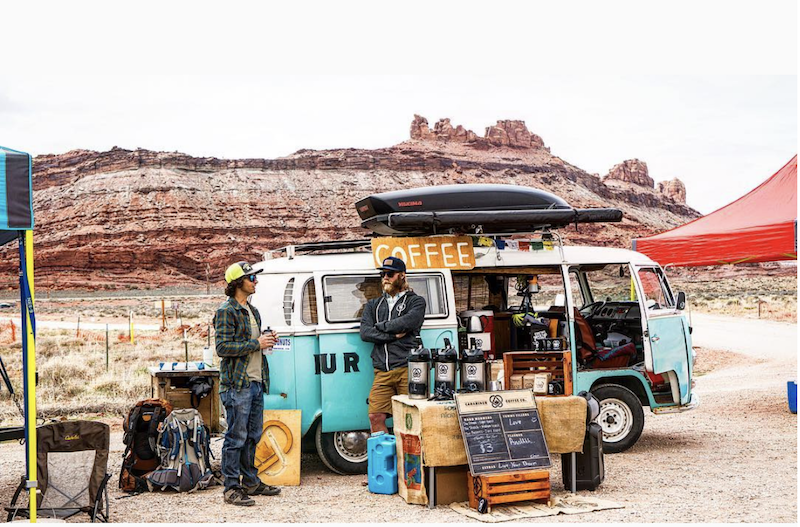 A mobile coffee shop run out of a 1971 Volkswagen dubbed Ol’ Blue, Carabiner Coffee serves customers at popular outdoor locales like trailheads, campgrounds, and climbing spots. Providing fresh, responsibly sourced coffee was always the goal, but the company’s mission goes deeper. Gordon says he started Carabiner Coffee because he wanted to create something that would inspire and bring people together around the things that made them happy. As a biker, runner, skater and climber himself, it was almost predestined that his niche market would become outdoor athletes and enthusiasts. The story of how the shop-on-wheels came to be goes back to the days right after Gordon’s college graduation. With a fine arts degree in hand and the looming question of “What’s next?” in mind, Gordon embarked on a 4,000-mile bike trip from his hometown in Minnesota to California. During his trip, on a cold and gloomy day in Oregon, he stopped at a small stand to warm up and ordered—for the first time in his life—a cup of coffee. Once he pumped the brakes on his epic bike trip, Gordon moved to Silverthorne, Colo. and started working for a small coffee shop, intent on learning everything he could about beans, origins and brewing methods. For eight months, he poured coffee and devoured industry knowledge before deciding he wanted the autonomy of being his own boss. Although Gordon knew he wanted to stay in the coffee industry, he also knew he wanted to do things differently. 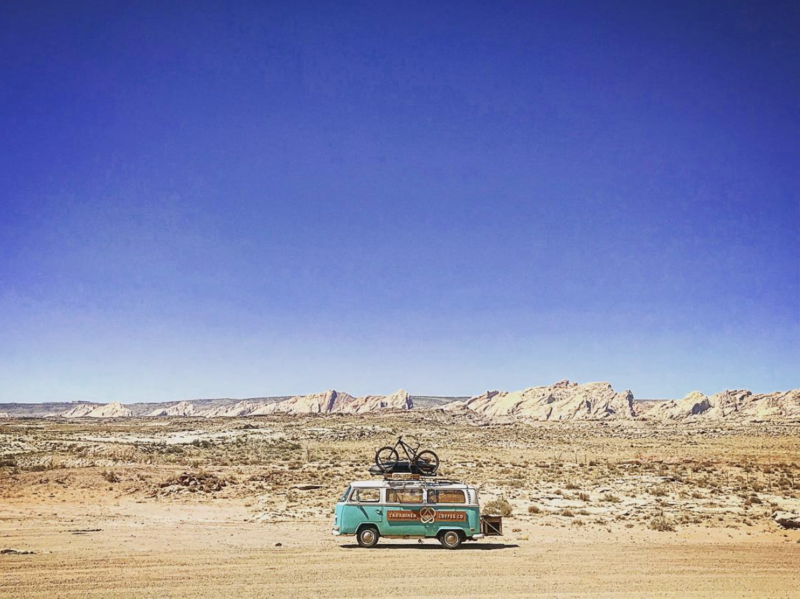 A self proclaimed “dirtbag climber” at heart, he started searching on Craigslist for his dream car—an old VW bus, naturally—and found the perfect one located in South Dakota. Anyone who has purchased a vintage bus knows they typically come with their own issues and require some tender love and care. Ol’ Blue was no exception and Gordon quickly got started on renovations. 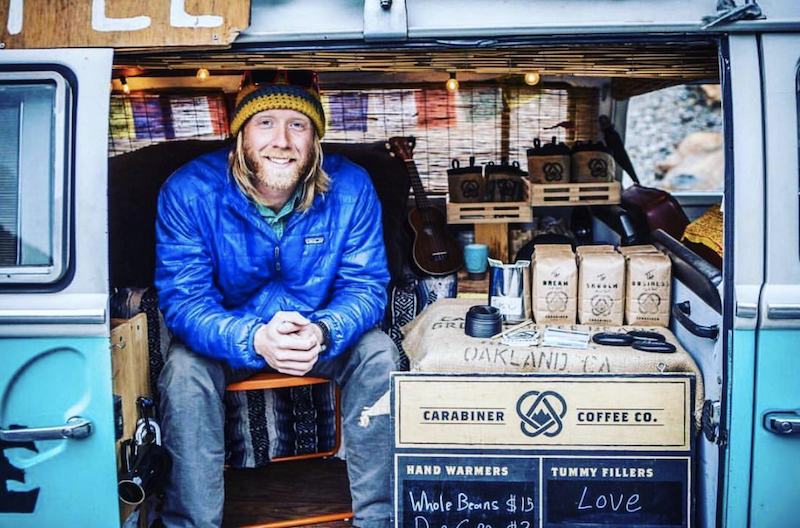 On April 20, 2014, he sold his first cup of coffee out of the van to his best friend and Carabiner Coffee was born. 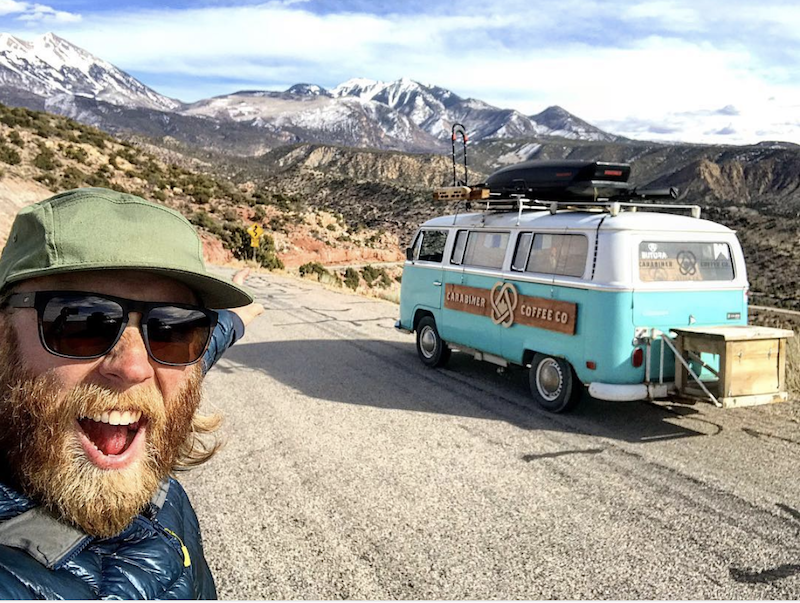 For the next two and a half years, he toured the country, selling cups of coffee and beans to climbers, hikers, skiers, and nomads. Although the operation wasn’t without its challenges—like constant leaks and holes in the floorboard—people loved the coffee, Gordon’s free spirit, authenticity, and his live-life-to-the-fullest attitude. Image courtesy of Carabiner Coffee. The mobile shop found so much success that it eventually found a more permanent home. With the help of a successful Kickstarter campaign, Carabiner opened its first brick-and-mortar location in Boulder, Colo. at the Rayback Collective—a food truck court—last year. Soon after, a second location, this one in Denver, popped up at the Wayfinder Co-Op. 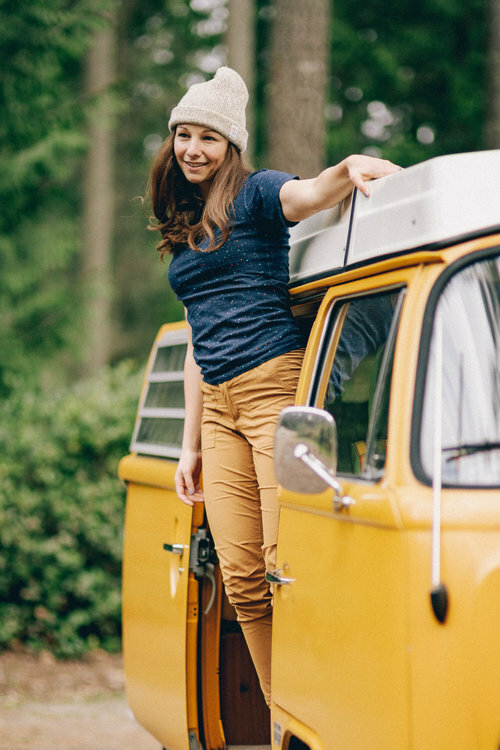 As Carabiner Coffee continues to grow, Gordon says the shop will always be more than just a great cup of coffee. He emphasizes that he never wants to lose the power to connect people in a meaningful way. 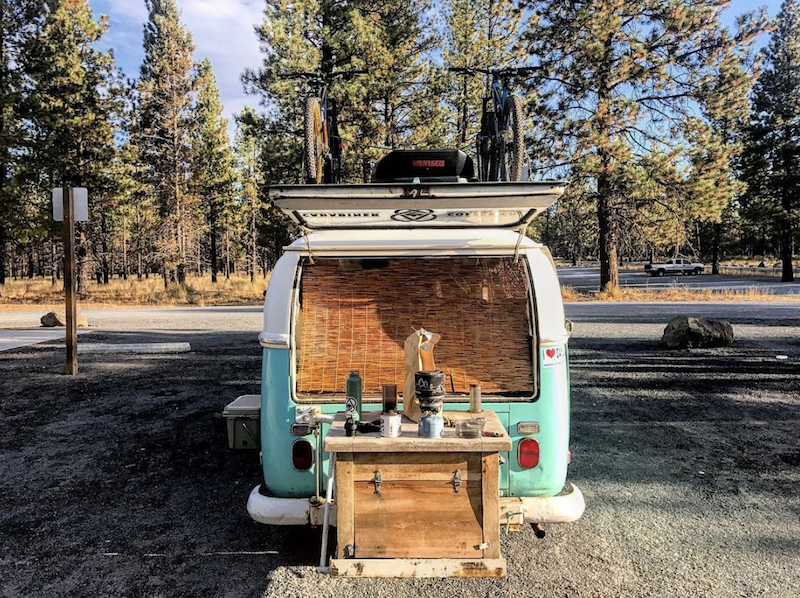 After all, forging community and inspiring his customers to spend more time in the places they love is one of the main reasons he renovated a VW bus in the first place.